Most towns and cities these days have a farmers’ market and they can be brilliant places for picking up local produce. Edinburgh’s port of Leith has its own market every Saturday, and on the first Saturday of each month this incorporates a ‘Vegan Quarter‘. I went along to the first one back in March. The market runs from 10am till 5pm and I turned up some time before noon. I was both excited and disappointed by what I found. 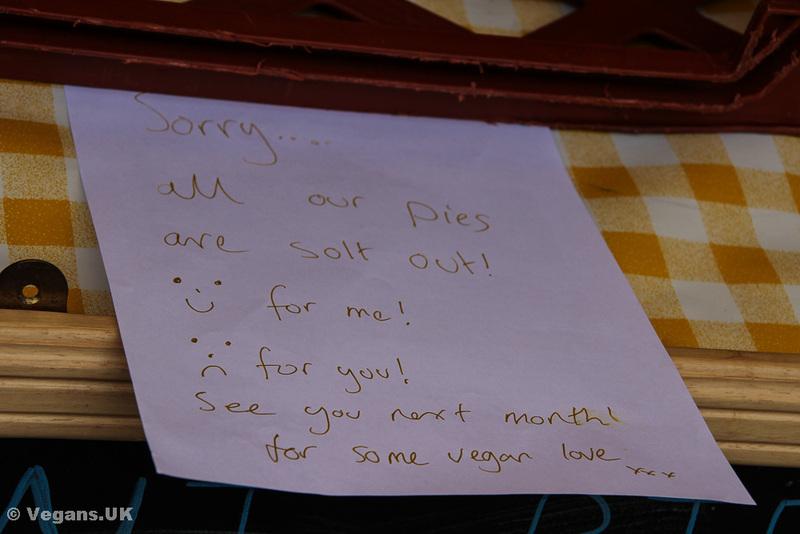 Many stalls, including the ever popular Missy’s Vegan Cupcakes and Cool Jerk, purveyor of pies, were completely sold out. There was nothing left. 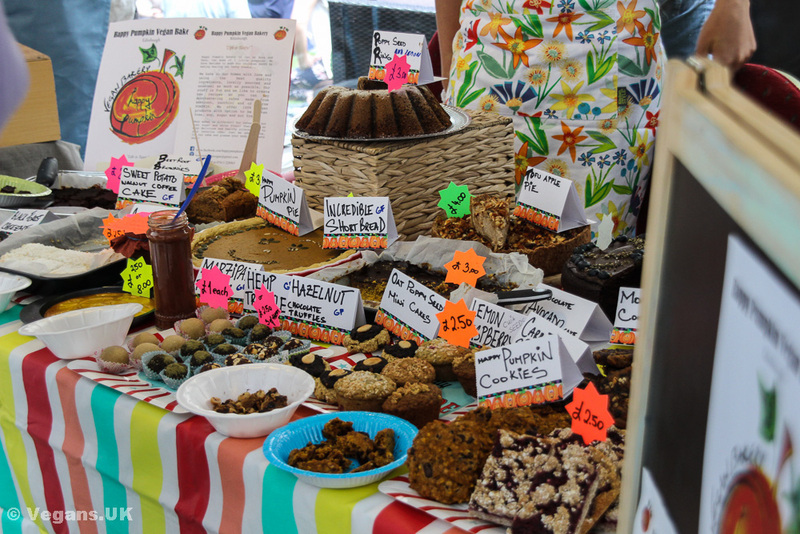 I wandered around and soon deduced that the vegan quarter in this particular market had been far, far more popular than most stallholders had imagined. The only stall I saw who seemed to have brought adequate stock was the ever-reliable Considerit Chocolate, so I purchased a few bars from them. Even Henderson’s, Edinburgh’s veggie temple since the sixties, was running low on grub. I left with my chocolate, both pleased that this idea was so obviously popular and slightly saddened that my haul hadn’t been greater. Fast forward four months. I made my way down to Leith a little earlier this time and was incredibly pleased to see every stall fully stocked. In the intervening period, the level of interest had been properly gauged and everyone seemed ready for the predictable hoards. 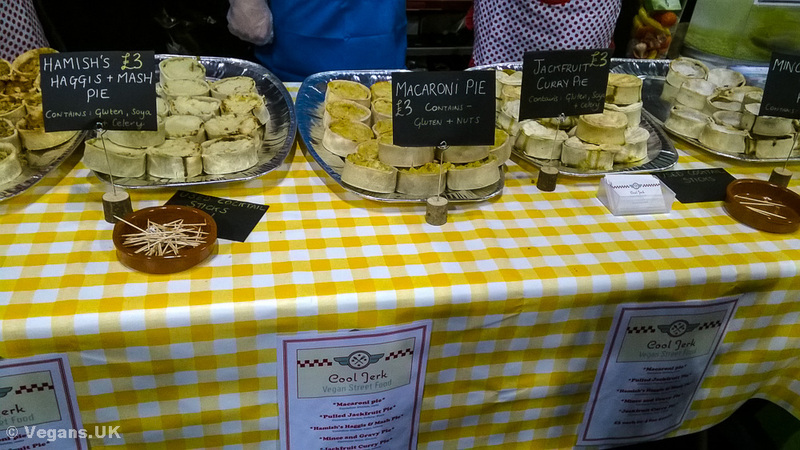 The cupcakes were back, the pies were back, Henderson’s were back with a delicious array of salads and vegan haggis amongst other things, there were bakeries and Sgaia Foods were there with their Mheat. Also in attendance were Go Vegan Scotland, an outreach group who mainly campaign in Edinburgh and Glasgow, providing anyone who wanted to know with information on going vegan. This is a fantastic addition to the vegan quarter. It’s great to woo people with yummy food but having these guys there to tell folk about how they can live a compassionate lifestyle is brilliant. My haul this time was much better, incorporating as it did, a macaroni pie. Strangely enough, these were not delicacies I particularly indulged in before I was vegan, but now I have a fascination for them. It made a very good lunch. I finished off with an indulgent slab of chocolate banana cake from the All About Patisserie. They are to be found at the vegan quarter every month it seems. Lovely stuff. The Leith market vegan quarter happens on the first Saturday of every month. See here for details. Happily, not even Storm Desmond seemed to dampen the spirits of the plucky attendees for the inaugural VegFest Scotland. December weather here is not known for its clemency, but the harshness of the wind and rain on the opening day, Saturday, was unusual even in these parts. Still, the stallholders, organisers, stewards, performers and volunteers battled on to welcome an enthusiastic, if bedraggled, crowd. The warmth inside the venue was welcome. Walking into the Glasgow SECC, I queued up to get some cash out (oh boy, what a gloriously wallet-emptying experience VegFest can be) and noticed an ad for a pantomime show starring David Hasselhoff and the Krankies. This venue is nothing if not eclectic. Once I’d entered Hall 3, I could look around me with a sense of great joy and satisfaction. 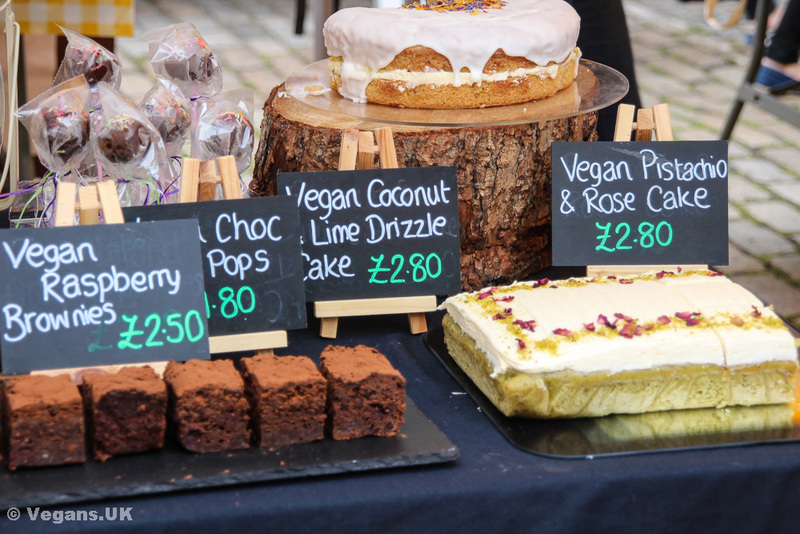 Finally, the biggest vegan festival in Britain was having an event in Scotland. All over the place I saw people delightedly sampling food from both UK wide and local businesses (such as Real Foods, an Edinburgh health food store). It is often commented on in vegan circles how, at a vegan festival, you can have anything you want! You don’t have to ask people if their food, or indeed clothing, is vegan friendly, because all of it is! Oh, the relaxation and sense of indulgence. I pottered around, sampling from all over the place. I enjoyed a secret sausage (well, quite) which is a lovely product designed to slip vegetables, undetected, onto children’s plates. They tasted so good and I could see how they would appeal to adults and children alike. There was chocolate too, sooooo much chocolate. It can be a bit of a struggle to give an indulgent box of chocolates as a gift, knowing they are cruelty free, but thanks to Pana Chocolate and the ever-reliable Considerit Chocolate, that need never be a problem again. Local business, Missy’s Vegan Cupcakes. 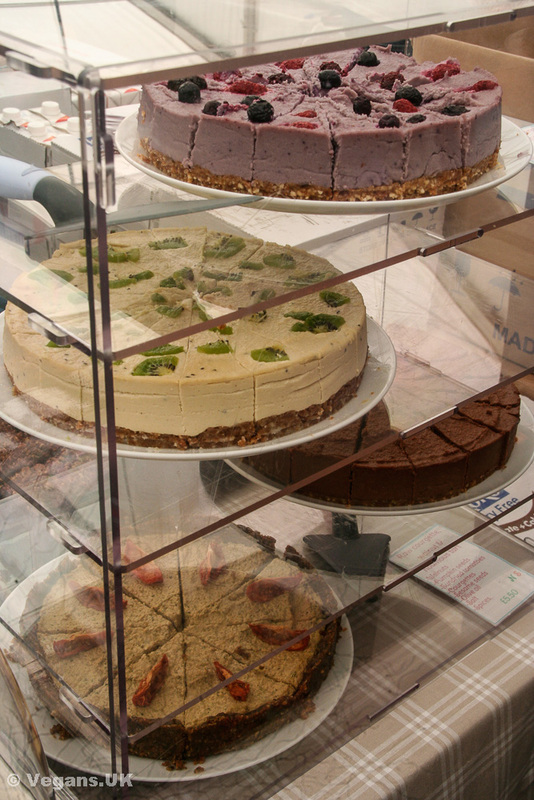 The array of cakes too, was an absolute delight, with local business Missy’s Vegan Cupcakes proving popular. I also sampled some lovely, fudgy chocolate peanut butter-type gorgeousness from Red Rosa’s Specialist Cakery, who were new to me. I won’t forget them in a hurry though, as their cakes were amazing. The cheeses too were a revelation. Although I’d tried Sheese from Bute Island Foods (who had some great looking ‘melty’ pizzas on offer) and Vegusto (I had one of their hotdogs for lunch on the Sunday) before, a couple of newcomers caught my eye. Tyne Chease from, unsurprisingly, the north of England, tasted great. 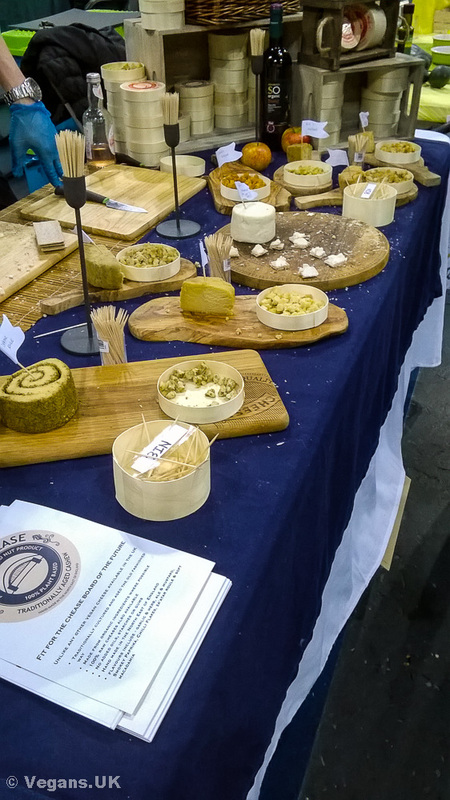 I was also particularly pleased to see a local firm from Glasgow itself, called the Nutcrafter Creamery. If you miss soft cheese especially as a vegan, you have to try their stuff, it was really scrumptious. After all this eating it was time for a sit down, and where better to place myself than at a talk by Tony Wardle from Viva! on saving the world with you knife and fork. Tony used to be a journalist for the Guardian and during his time there he realised that although world leaders knew well that animal agriculture is the main cause of all the environmental problems we have today, none of them wanted to admit it for fear of making themselves unpopular. I mean, would you want to be the politician who tells their constituents to go veggie? Also, many of our representatives in Westminster are in the pocket of the animal agriculture industry and so continue to suppress any progress for fear of losing their money. It was an illuminating and entertaining talk, even although poor Tony had to compete with one of the louder stage performers of the day. He also has a book out, Pod, which is an environmental thriller. I bought a copy and can’t wait to read it. Talk with Jane Easton and Justin Kerswell of Viva! I grabbed a quick drink from the Fentimans bar (superlative ginger beer) and headed over to the Viva! Health Summit. Jane Easton (who wrote the brilliant Viva! Cookbook) and her colleague Justin Kerswell talked about all the free resources there are out there for both new and existing vegans. They are very much, as I am, about making veganism mainstream, and have a worldwide database of vegan-friendly places to eat. They hope to be able to compile it so as to make things easier for the travelling vegan. They also have great little cards which you can leave with your bill payment at a restaurant that say ‘Thank You! I ate here because you offer vegan food.’ What a brilliant idea! It’s not all about eating lentils from a clog, as Jane says! With so many beautiful caterers to choose from, it was tricky to pick just one for lunch. 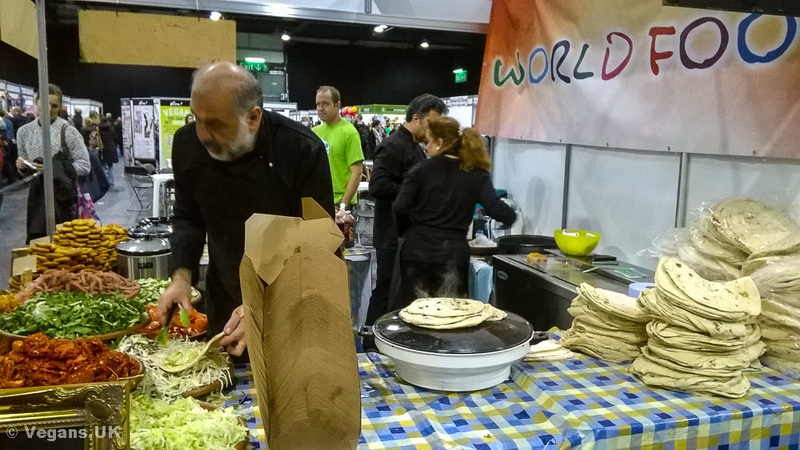 The queue at World Food was massive, as usual, but somehow I’d managed to sneak in at a quiet bit. They serve the most delicious lentil patties in different flavours, with an incredibly varied salad, all wrapped up in a fluffy, warm tortilla. What could be better? They work fast at the World Food counter. Performances over the weekend ranged from musicians, to performance poets, to comedians and I was lucky enough to catch most of Andrew O’Neil‘s set late on Saturday. 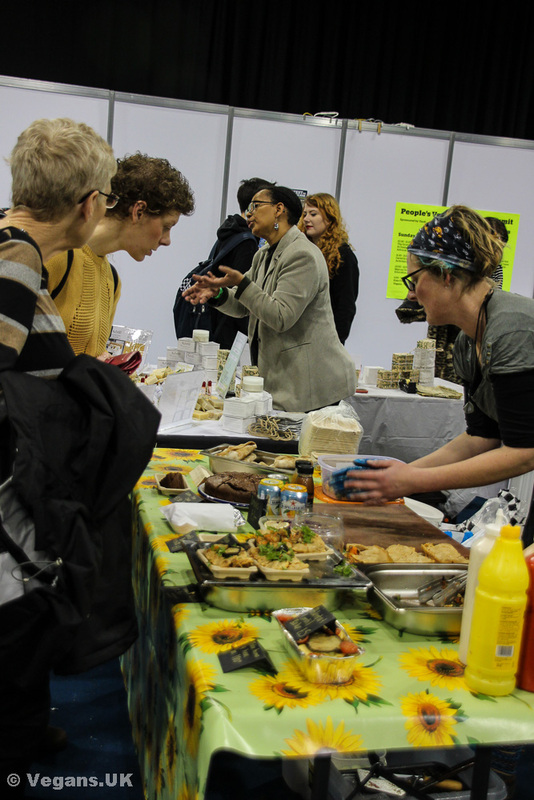 The whole place was buzzing over both days, with juicing and spiralizer demonstrations making me feel like I was at a market. It’s not all about food though of course. Honestly! There were so many other treats to check out. The wonderful ladies from Bohemian Chic Minerals were there, with their array of cruelty free make-up especially made for those (like me) who have sensitive skin. They’d come all the way from Slough. Beautiful handcrafted jewellery (I loved the Agharta pieces) and ornaments (some carved from ‘vegetable ivory‘ from Ecuador) were on display, as well as all manner of clothing and footwear. I met the lovely couple from Humane Wildlife Solutions, who take care of your ‘pest’ problems kindly and effectively. What a brilliant business! Let’s also not forget the many charities represented. The woman on the Hugletts Wood Farm Animal Sanctuary stall was lovely, and keen to tell of the life-saving work they do there. I bought a T-shirt from the Coalition to Abolish the Fur Trade and again, I’m so impressed with the work they’re doing. On the Sunday I went to a cookery demonstration that Jane Easton was doing and even got to try some of the delicious barley risotto that she made (recipe here.) I even went up for seconds. Yum! Barley is commonly used in soup in Scotland, but it was a refreshing change to see it used like this. The best talk of the whole weekend was definitely Dr. Melanie Joy on Understanding the Psychology of Meat for Effective Vegan Advocacy. I am an admirer of hers, but this is the first time I’ve attended one of her talks, having seem a fair few on YouTube. She is the author of Why We Love Dogs, Eat Pigs and Wear Cows. Her understanding of not only the subject of veganism, but also what she refers to as carnism (the meat-eating ideology) is impressive. Being a social psychologist, she detailed effective ways of communicating with people, along with ways to avoid burnout and I took copious notes. The kids of Sunnyside Primary doing sterling work for animals. I must also tell you about the quite inspiring children of Sunnyside Primary School. They are doing a project on how cruel it is to capture dolphins and whales from the wild and make them perform in places like the much derided Sea World. 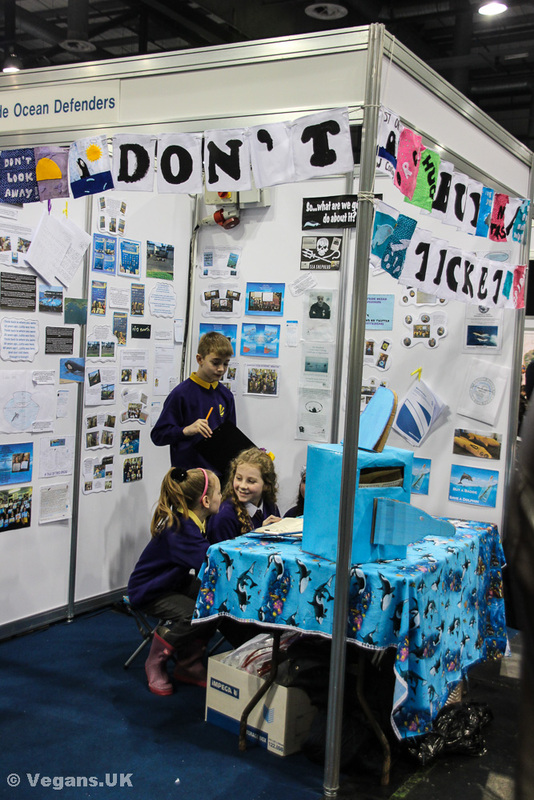 Two of the very well informed children gave me a little tour of their display. They were selling badges to raise money for their cause and of course I bought some. They’ve been endorsed and commended by Sea Shepherd no less and you can follow them on twitter here. Henna tattoos. What design would you get? If you would like information about your nearest vegan festival, Animal Aid have a pretty comprehensive list here. Do go and support them and take non-vegan friends and family to introduce them to the joys of a vegan lifestyle! …but sometimes you just want a pizza. The Flying Duck is easy to miss. Coming from Edinburgh on Saturday 4th April, I knew that it was close to Buchanan Street Bus Station, but hadn’t appreciated quite how close. It was a sunny day in Glasgow, which made it slightly incongruous to be descending the steps into a nightclub located up an alley off Renfield Street. But descend them I did and was welcomed into the friendly, chaotic world of the Vegan Fete. The darkness, crowds and pulsing music soon made me forget it was daylight outside and I took to perusing the stalls of, let’s face it, mainly cake. Not that I’m complaining! Quite the opposite. The Hunt Sabs and The Vegan Kind were there amongst other familiar faces (if I haven’t mentioned you it’s because I didn’t see you – it was quite dark and my eyesight isn’t what it was!) but the cakes were the items that seemed to produce the biggest queues. Smashing Tarts, for it was they, had the biggest one when I was there, and no wonder with that fabulous array of super-indulgent wares. As well as Daiya cheese twists they had Bourbon cake and tiffin, ganache cake and coconut cake and countless other delights. I made a few purchases… I’d been invited on twitter to try out Dairy Free Tablet’s Mint choc offerings and oh goodness, it was good. I may have eaten almost a whole bar on the bus home, but don’t tell anyone. Considerit chocolate were also exhibiting, they of vegan cream egg fame, and I sampled some of their Amaretto truffle bar, leading me to buy not only that but also the orange flavour and the coffee and muscovado flavour. I needed a distraction from all this sugar and so wandered over to Kirsten Scott’s table of delightful jewellery and clay crafts. 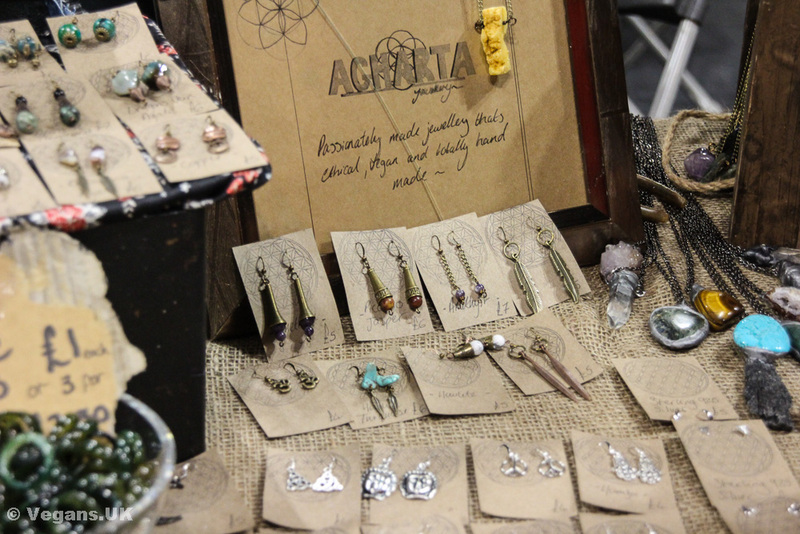 Many of the earrings were animal themed and I fell for a gorgeous fox design. There were food themes too, with bracelets made from tiny slices of Battenberg cake and Swiss rolls amongst others. All in all it was a lovely fete, and although a bit warm and crowded, I was glad to see such an event have an obviously big following. This is the first big vegan fair in Scotland this year, with Vegan Festival in Edinburgh in August and then the big one, a two day Vegfest in Glasgow in December. Vegan festival is in Newcastle as well, in July, and having attended last year I can say it was a great place to be. Have fun at the festivals! These events are growing more and more popular and taking place in more places throughout the country, so whether you’re in Liverpool, London, Brighton, Bristol or Birmingham, or indeed anywhere else in the UK, there should hopefully be a vegan festival near you soon. Have fun!